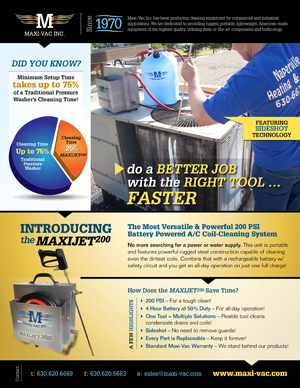 The most versatile and powerful 200 PSI battery powered A/C coil-cleaning system - No more looking for power or water supply. Do more jobs with the right tool and increase your profits. Portable, Powerful Rugged Steel Construction capable of cleaning even double coils, rechargeable battery w/ safety circuit gives all day operation on a full charge! How much time can you save? Watch How The MaxiJet200 Saves Time! For over 40 years Maxi-Vac has been the leading manufacturer of industrial quality equipment which moves us away from being a replacement nation - one machine at a time! Maxi-Vac is the best choice for quality, and most convenient source of maintenance equipment. Maxi-Vac uses the ultimate quality components in all of our equipment. Maxi-Vac uses the widest range of distribution channels to help you and your business make your purchase. Maxi-Vac offers a variety of DC Motor (Full Torque at low speed) Direct Drive Tube Cleaners to serve your needs of maintaining chiller tubes, boilers, and heat exchangers. A lineup of A/C Coil Cleaning Equipment designed to meet every specific commercial and residential need. Draught Line Cleaning Pumps for bars, restaurants, and stadiums. Battery, Gas, and Electric Pressure Washers, Steam Cleaners for other building maintenance needs and the hospitality industry. Our clients range from the US Military, Coast Guard, Schools & Universities, Government Buildings, hotels & apartments, HVAC/R contractors, and building maintenance contractors to you! Our primary goal is to help our clients succeed while performing their job in an easy, efficient and proffessional manner. Please visit Maxi-Vac's website to view the entire line of washers and cleaning systems.